Application of per- and polyfluoroalkyl substances (PFASs) is shifting to short-chain analogs (C ≤ 6) that raises concerns for their potential ecotoxicological risks. In the present study, pot experiments were carried out to study the effects of perfluoroalkyl acids (PFAAs), including perfluoroalkyl carboxylic acids (PFCAs) and perfluoroalkyl sulfonic acids (PFSAs), with different carbon chain lengths (C4, C6, and C8) on the growth of wheat seedlings and their plant uptake and transfer at two spiking levels (200 and 2000 μg/kg soil). 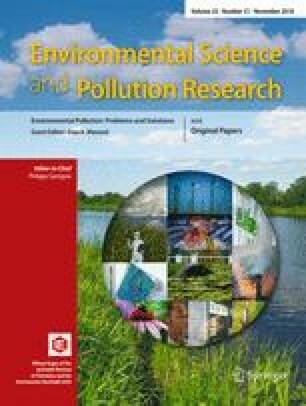 Exposure to C4 PFAAs slightly inhibited chlorophyll activity, whereas exposure to C8 PFAAs showed enhancement. The bioaccumulation factors (BAFs) for C4 PFAAs in wheat were over 10, while BAFs for C8 PFAAs were all below 1. Rhizospheric and root to shoot transfer factors for PFAAs were both negatively correlated with their log Kow (p < 0.05). PFCAs exhibited both higher rhizospheric mobility and accumulation potentials than PFSAs of the same chain lengths. Hence, perfluoroalkyl chain governs the mobility of PFAAs in a soil–plant system besides interactions of their head groups, and the substitution with shorter chain PFASs raises concerns for their higher plant accumulation potential that brings higher ecotoxicological and human exposure risks via food chains. The online version of this article ( https://doi.org/10.1007/s11356-018-3070-3) contains supplementary material, which is available to authorized users. The present study was financially supported by National Natural Science Foundation of China (no. 41573097) and The Ministry of Science and Technology (no. 2014CB441104) and Ministry of Education of China (111 program, no. T2017002).